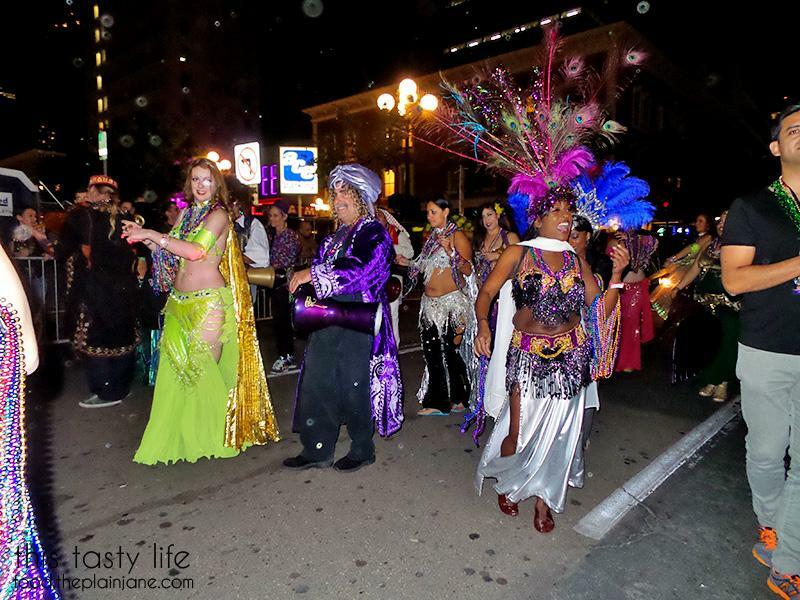 The real Mardi Gras is always Fat Tuesday (yesterday) but in the Gaslamp they celebrated Mardi Gras last Saturday! I got semi-dolled up for the night with Jake in tow. 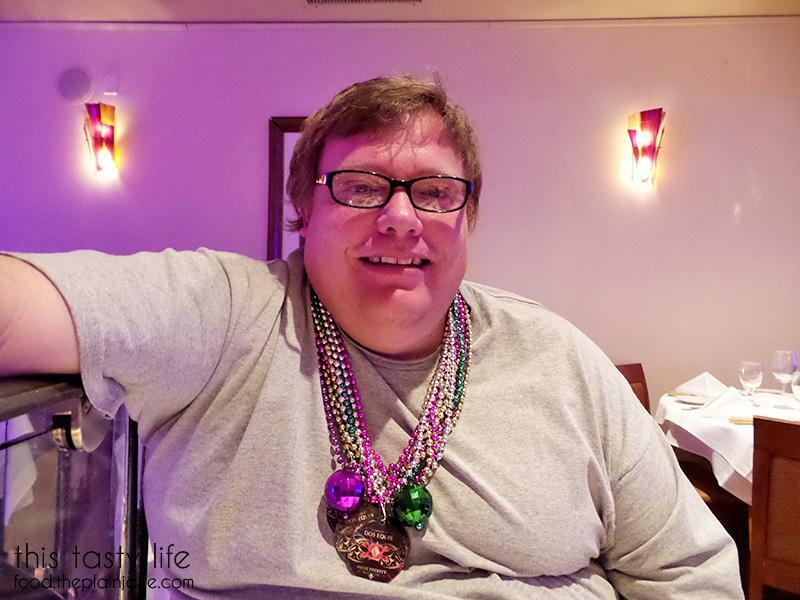 I already had some beads from my dinner at Blush Ice Bar, too. Little did I know how many beads we’d manage to get later. 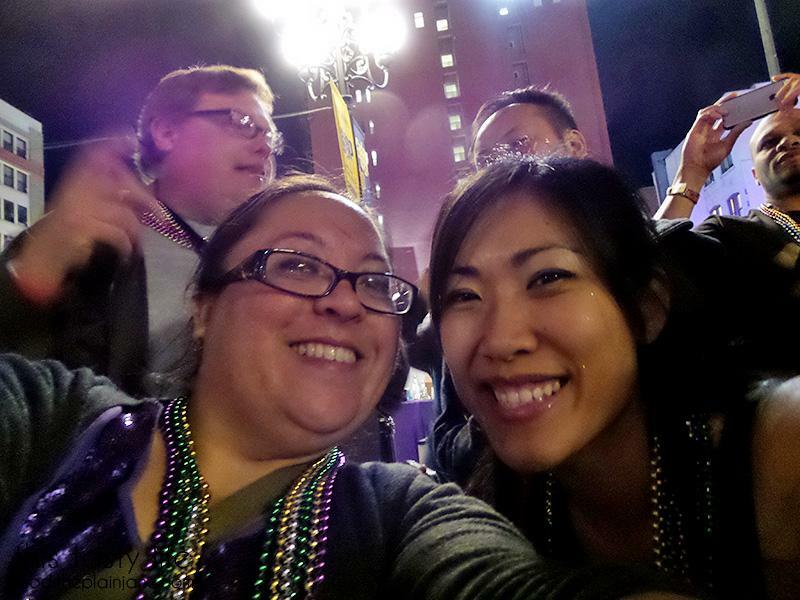 Our night out in the Gaslamp included a wonderful dinner at Greystone Steakhouse as well as partying at Mardi Gras. We headed down to the Gaslamp Quarter a bit early to avoid traffic and parking hassles. I scored us a parking pass online which netted us parking for a mere $10 at the Horton Plaza parking garage. The Mardi Gras event was only a block over. 5th Avenue was blocked off or a few blocks allowing for the huge block party to take place later that evening. After getting into the event (which was a bit of a confused mess for VIPs trying to get their passes), Jake and I walked up and down 5th Avenue looking at all of the menus of the restaurants. 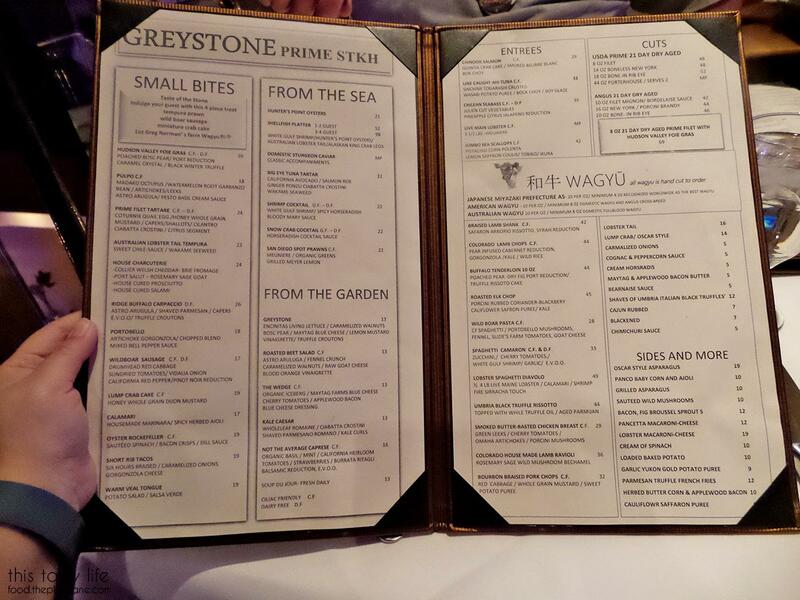 After getting some snooty-ish looks from a few hostesses, we finally selected Greystone Steakhouse since the hostess was really nice to us, explained a lot of stuff on their menu, didn’t get all huffy and also gave us a coupon for a free appetizer. Score! 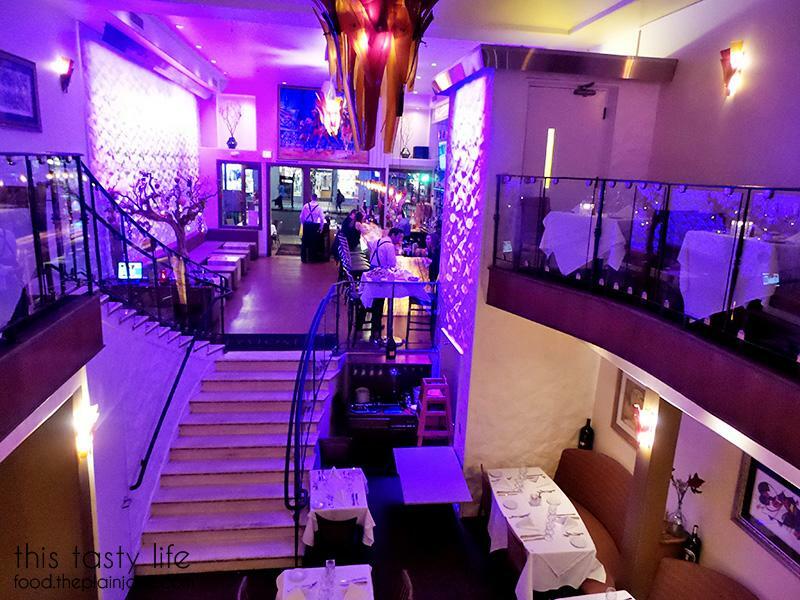 We were seated at a sweet little table with this sweeping view of the staircase. 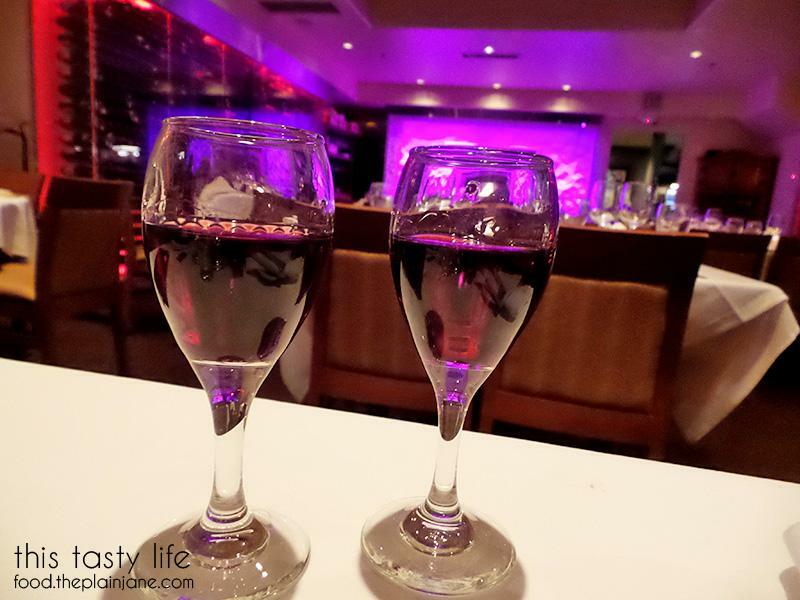 The restaurant was aglow in pretty purple lights. There was a fireplace on the other side of the upper dining room. Later in the evening a couple requested to sit there and the staff turned on the fireplace for them. 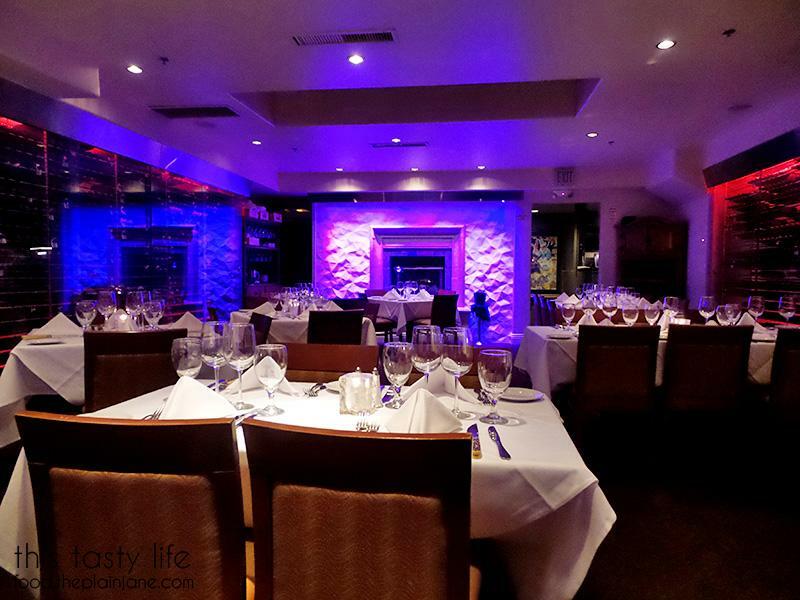 Greystone Steakhouse has an extensive steak menu! 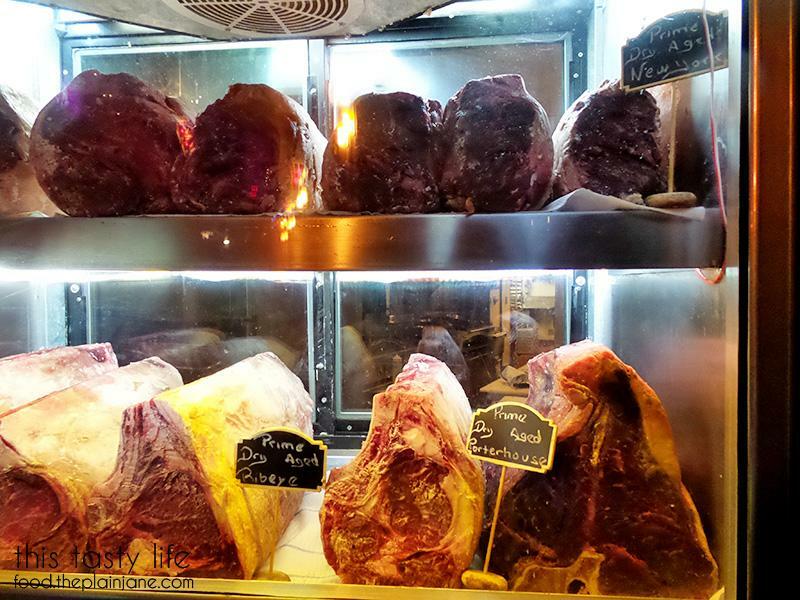 They offer Wagyu beef three different ways – Japanese, American, and Australian wagyu. Our awesome waiter, Giovanni, explained what the wagyu beef was and how it differed from the other steaks. He even explained that the Japanese cows are treated on a whole other level than the American and Australian cows and that was why the price was so much higher. Apparently the cows in Japan live the good life with massages and super special diets to make the meat extra tender. The Japanese wagyu is $20 per ounce, with a minimum order of 4 ounces. Holy cow! It was a little too rich for our blood. Instead, Jake and I choose their dry aged ribeye steak to share. 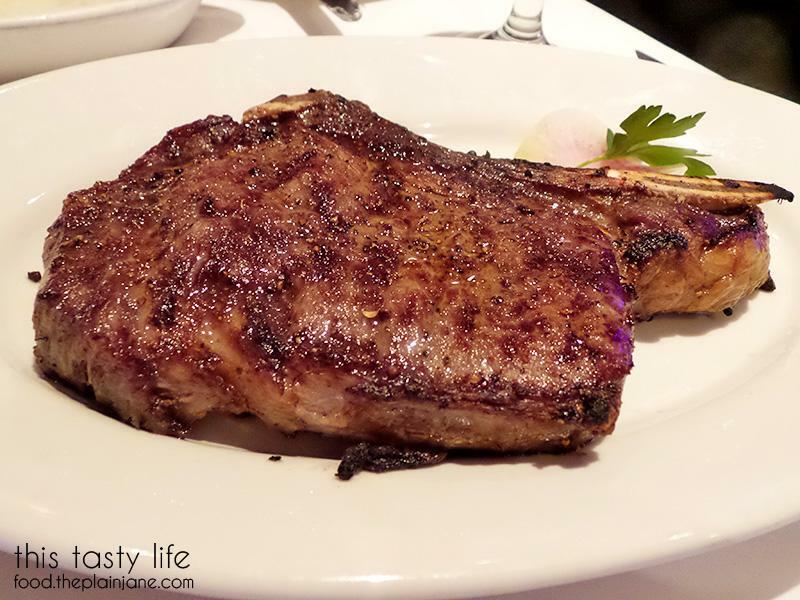 Giovanni told us that the ribeye is his personal favorite on the menu and we had a feeling we’d be in for a treat! Downstairs near the kitchen they have a tiny fridge which shows off a few of their dry aged beefs. Yum yum! Here’s Jake already dolled up with a few of my beads. We were served some freshly baked bread and butter with a few herbs in it. The bread tasted like it was just baked and reminded me of the no-knead bread that I sometimes make at home. It was crusty, soft, and still hot! It tasted wonderful slathered in some of their delicious butter. I spied a few herbs in the butter (maybe like three little leaves or dots of something). 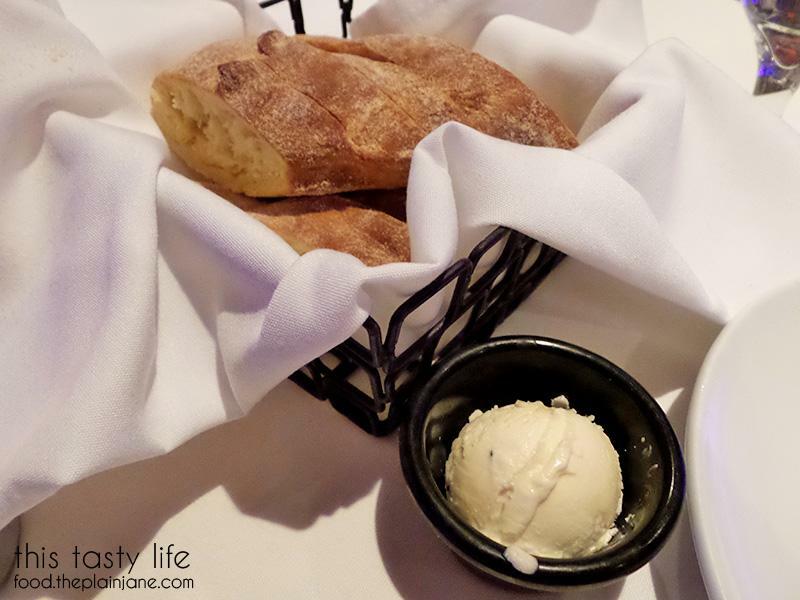 The butter was soft and spread very easily on the hot bread. Mmmmm. With the complimentary appetizer card we received from the hostess, we were able to choose between two appetizers: calamari or wild boar sausage. Without missing a beat, Jake requested the wild boar sausage since calamari is not something he enjoys. 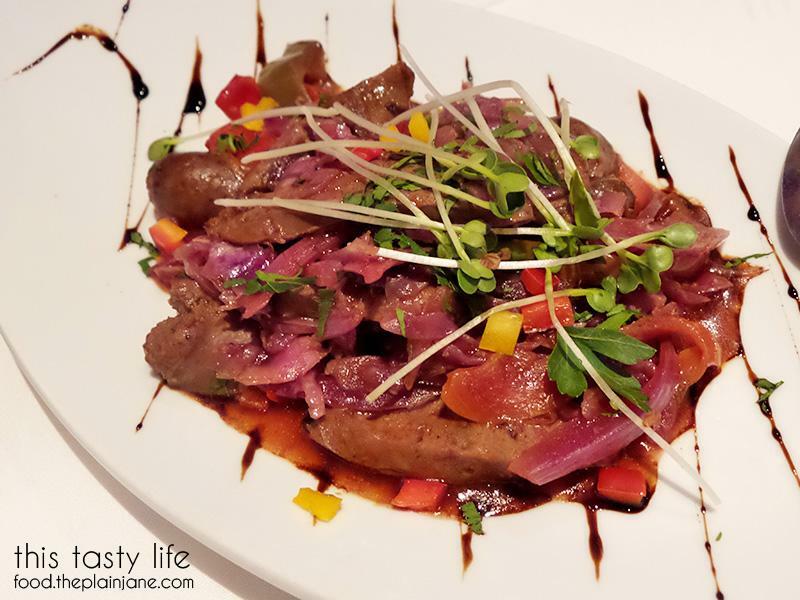 We were presented with this lovely looking plate of sausage, onions, and peppers with a pinor noir reduction sauce drizzled over the plate. This reminded me of a super fancy open faced sausage roll – but without the bread – since it had sweet onions and peppers mixed in with the incredibly sweet and tender wild boar sausage. I was a little surprised at how sweet the sausage was – not in a bad way, either. It was the perfect amount of sweet and savory. Jake and I really loved the wild boar sausage and thought it was a perfect appetizer. 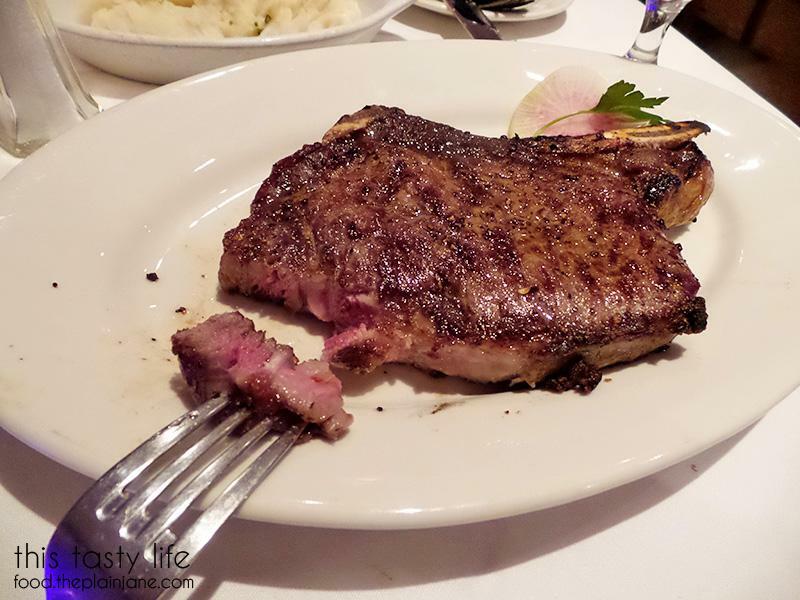 Now this is a steakhouse which means when you an order a steak… that’s all you get. Just steak! 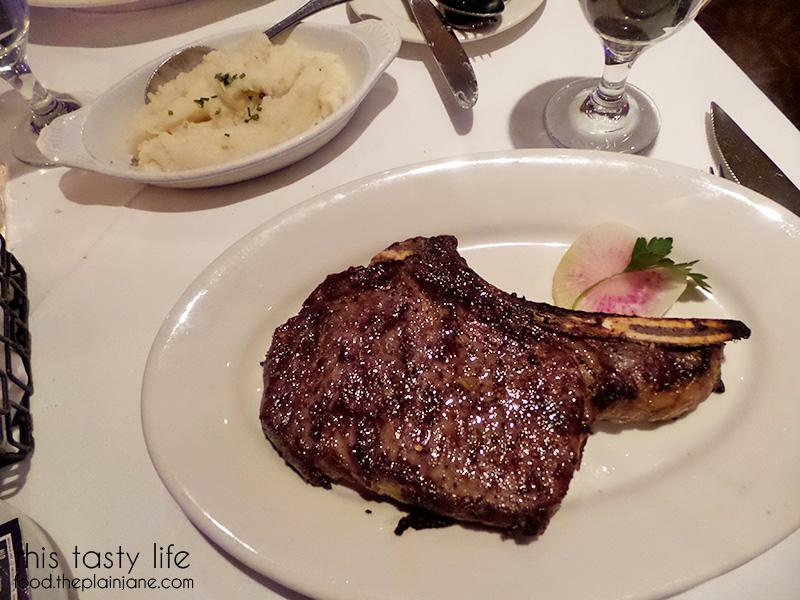 To compliment our meaty meal, we ordered one side – the Garlic Yukon Gold Potato Puree for $9. I wish we had ordered a veggie instead (like asparagus which was available that day) since the potato puree was just okay. It wasn’t outstanding and I felt it needed a little more seasoning – and even a bit more garlic! The ribeye steak on the other hand did NOT disappoint. This ribeye was gigantic and a great size for sharing. I think we could have even split this sucker three ways if T had been with us! Jake was nice and patient with me while I snapped tons of photos of our beautiful ribeye. I was nice enough to give him the first piece of steak though since he was being so patient with me. Then I cut him off a piece for his plate and was rewarded with this perfect medium rare pink center. We didn’t get any additional sauces or toppers for our steak. The tender, juicy steak stands on it’s own and didn’t need anything else. My favorite part of the steak was when I got closer to the bone for all those little fatty bits at the end. I will totally admit I picked up the bone and gnawed on it. Fancy dining be damned! 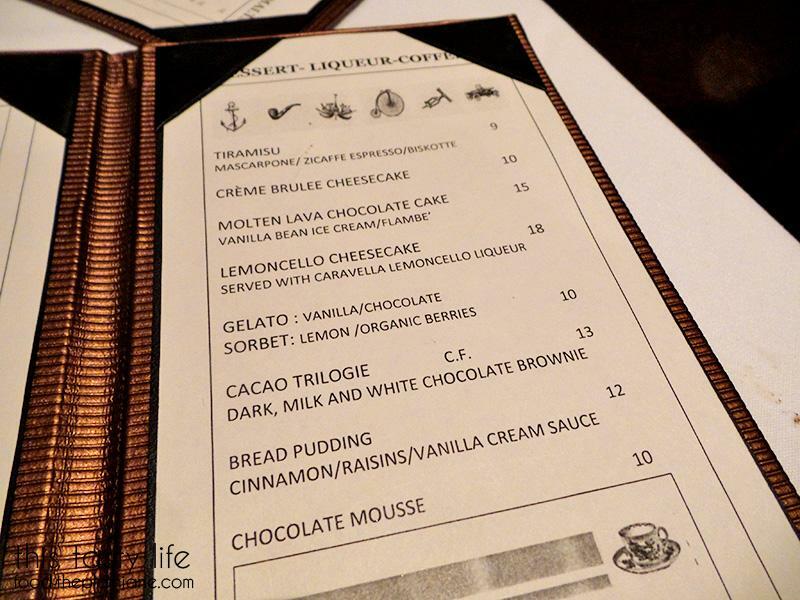 I wasn’t going to order any dessert at first but Jake and I kind of lit up at “Lemoncello Cheesecake”. I almost didn’t get it but Jake is totally an enabler. One of the other waiters, Ana, came by to check on us and we got to chatting with her as well. She was incredibly sweet and helped us out with ordering dessert. She was so bubbly and happy and we just loved her! 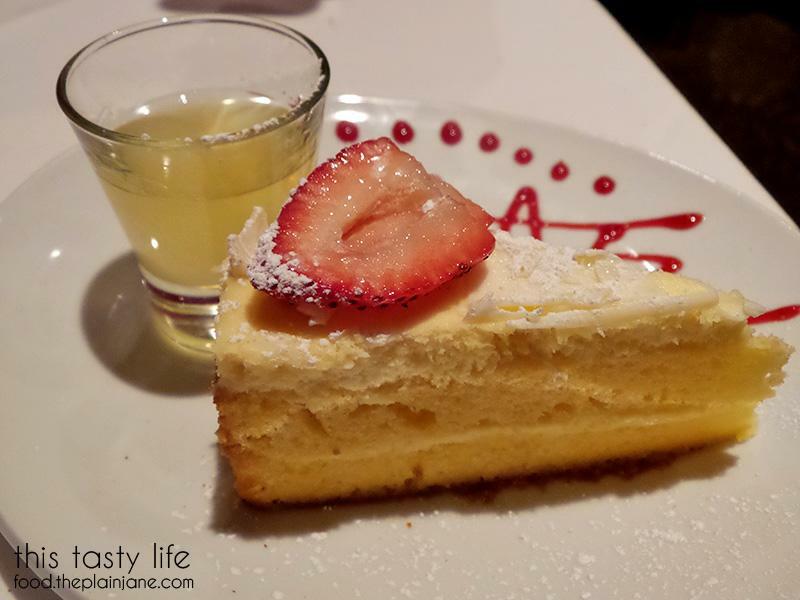 The cheesecake (which is more of a cake than say a NY style cheesecake) came with a shot of Caravella Limoncello. Giovanni told us we could either sip the limoncello or pour it over the cake. I did both but I prefer to just drink it on it’s own (which I did – Jake let me finish it). The cheesecake was more cake-like in texture and flavor than what I was expecting since I was expecting a creamy NY style cheesecake. So in that regard it was a little disappointing… but the dessert was still delicious. I wish the shot was an option, like, if you wanted it you could add it on or leave it off to bring the price down a teeny bit. In any case, I still enjoyed it – it was incredibly packed with lemon flavor – there was a cake layer and some cream and maybe even a layer of mousse in there. Jake at some point asked Giovanni if he could see one of the Waygu beefs just to see what the marbling looked like. Giovanni sent Sara over. Sara is the Director of Operations at Greystone Steakhouse and she showed Jake a few pictures of the beefs. 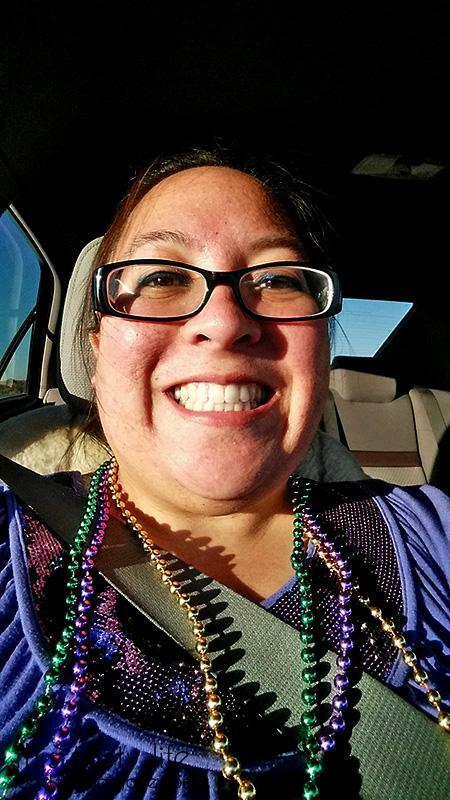 Jake commented to her about how great the service had been and that Giovanni and Ana were very helpful. Sara sent us up a couple of glasses of port wine for us to enjoy on the house. How sweet! Jake passed on drinking these but I happily indulged and drank both. I do like port wine after all! It was a perfect after-dinner drink and helped me to “get ready” for our night out at Mardi Gras. 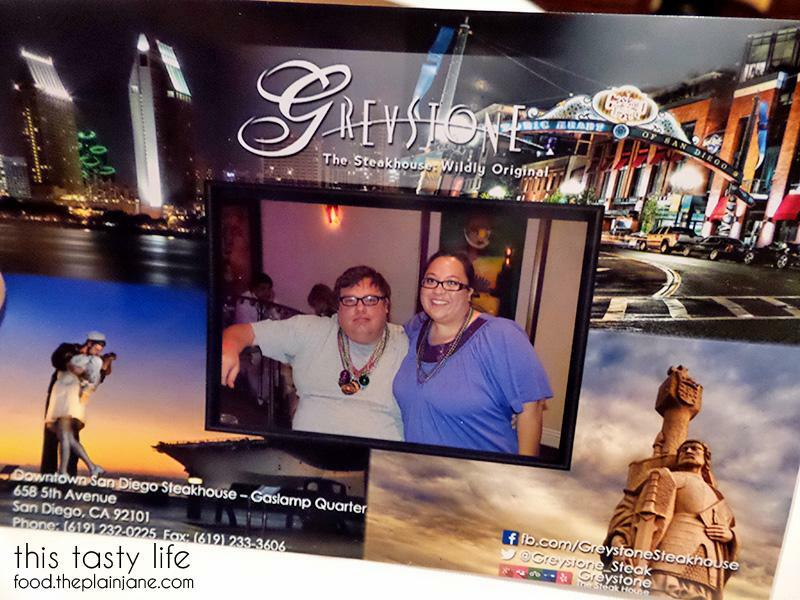 We even got this sweet complimentary postcard from Greystone Steakhouse. They take your photo and offer a free postcard. They of course also create nicer photos in a nice folder/frame for purchase but we declined and just accepted the complimentary postcard. It was a great meal with wonderful service and I highly recommend a visit to Greystone Steakhouse if you have the chance to visit. After finishing our meal, I texted Lynn from oh-so yummy so we could meet up! Since we earlier had a problem getting our complimentary VIP passes, Jake and I left and went back outside to the line that was much shorter now and after speaking with someone, they gave us our proper VIP bands and passes. That way we could head over to the VIP lounge for some complimentary drinks! 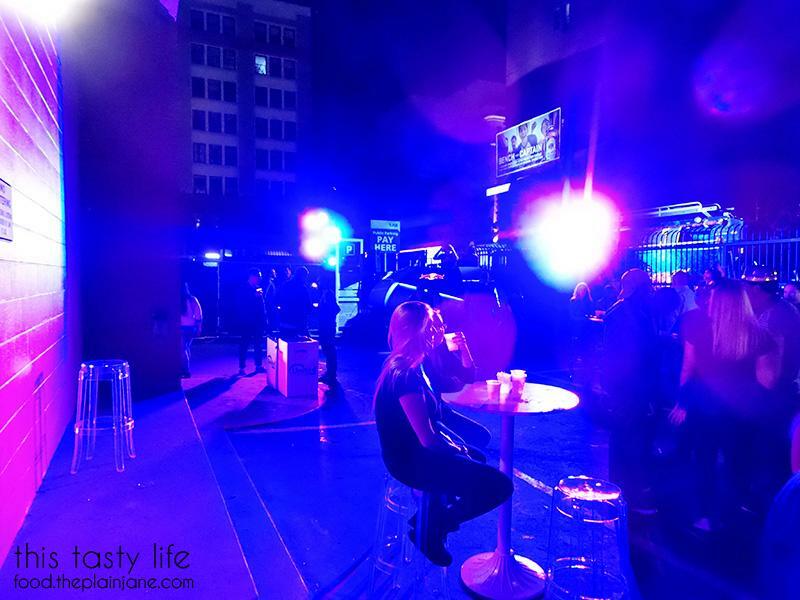 Pssstt… the VIP lounge was really just an alleyway. HAH. There was a bar area and as a VIP you were able to get any three drinks. I stuck with a whiskey coke for my beverage of choice that night. There was a DJ playing plus a few tables here in the VIP lounge. 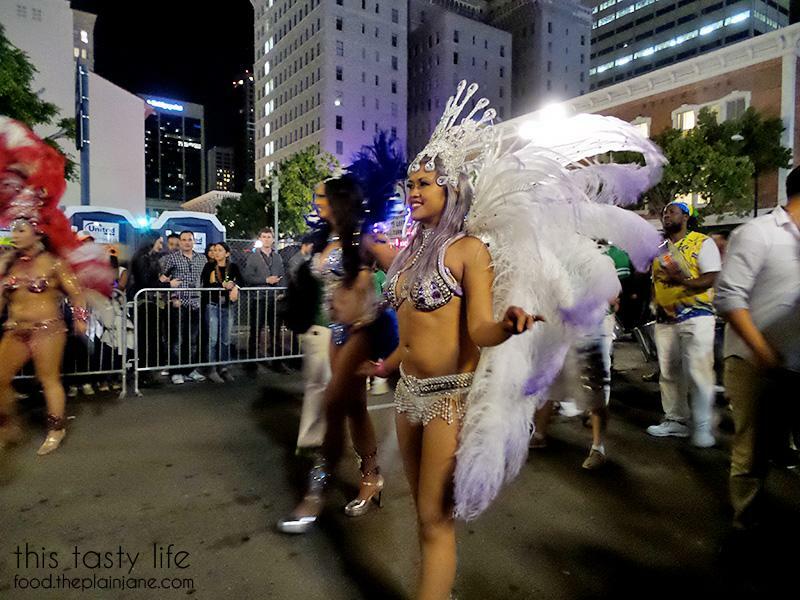 The other nice part around the VIP lounge was there was a roped off area for viewing the Mardi Gras parade. I was able to be right up in the front at the beginning of the parade instead of stuck behind a bunch of tall people. Lynn and Dennis had to leave early but we managed to snap a quick selfie before they left. 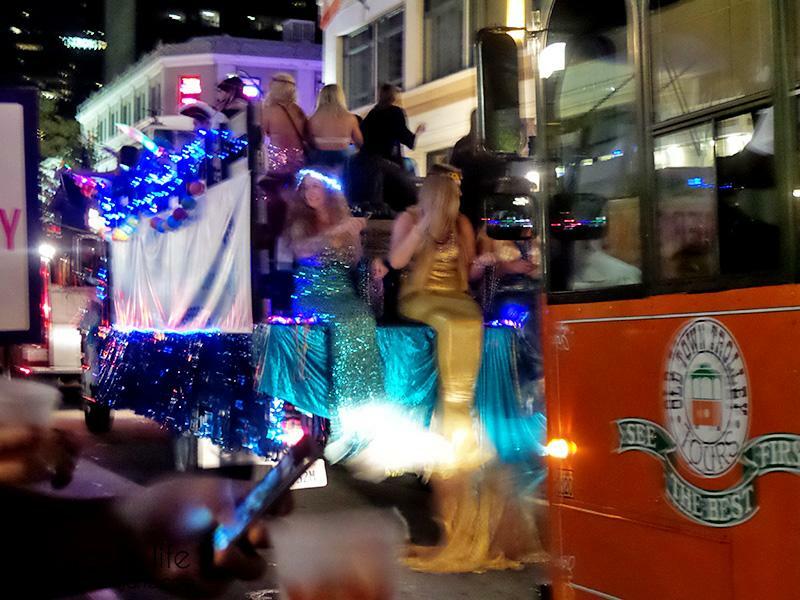 Those are mermaids on the back of the float! 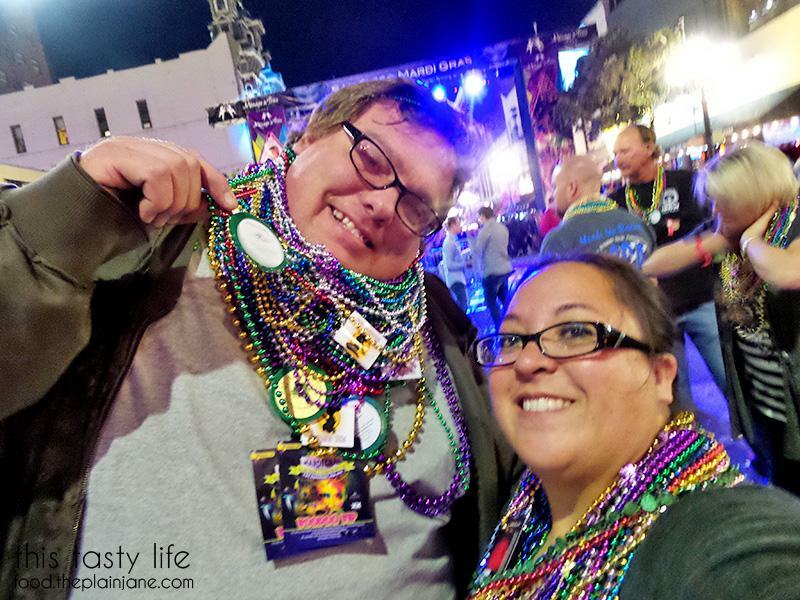 Jake and I managed to get quite a few beads! Everyone in the parade was pretty into throwing beads around at the crowd. I actually got smacked pretty hard in the forehead by a pair of flying beads! 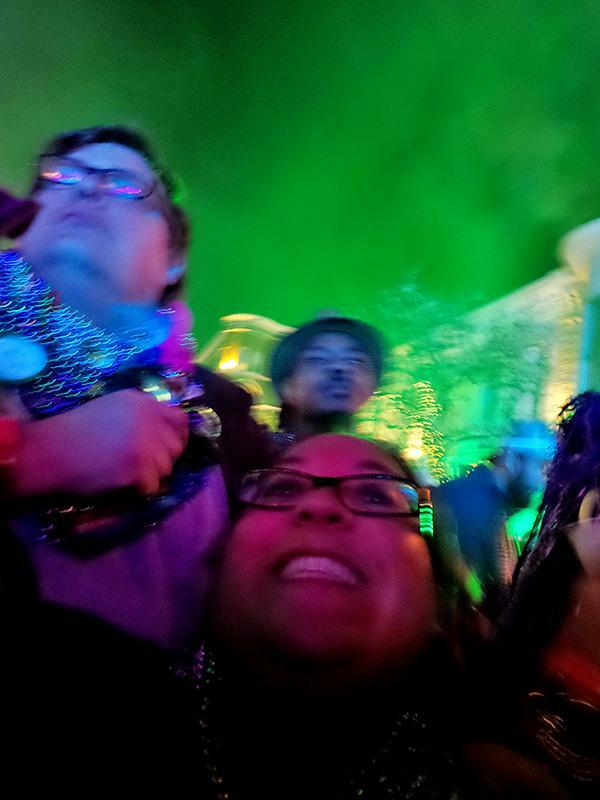 After the parade was over there were TONS of beads scattered all over the ground and Jake picked up like…. all of them. And put them around his neck. He’s got so many beads it looks like his neck is MADE of beads. He was pretty darn proud of himself and his bead collection. After the parade we headed over to the King Club Stage to see one of Jake’s favorite groups, Bone Thugs & Harmony. This is a rap group. I don’t really care for rap music, really, but I care A LOT for Jake and this was pretty much the reason for us coming to this shindig. Since I’m short and little, I managed to dart around people and get us up pretty close to the stage so Jake could enjoy the show. All around me I witnessed a lot of weed smoking, couples making out, a lot of bouncing and singing, and a lot of squeezing. Jake managed to keep people off me as best he could and I just kind of chilled out with my buzz while the show went on. Jake enjoyed it very much and that’s what counts! Disclaimer: Our VIP tickets to the Gaslamp Quarter Mardi Gras celebration were complimentary thanks to McFarlane Promotions. I was not further compensated for this post. 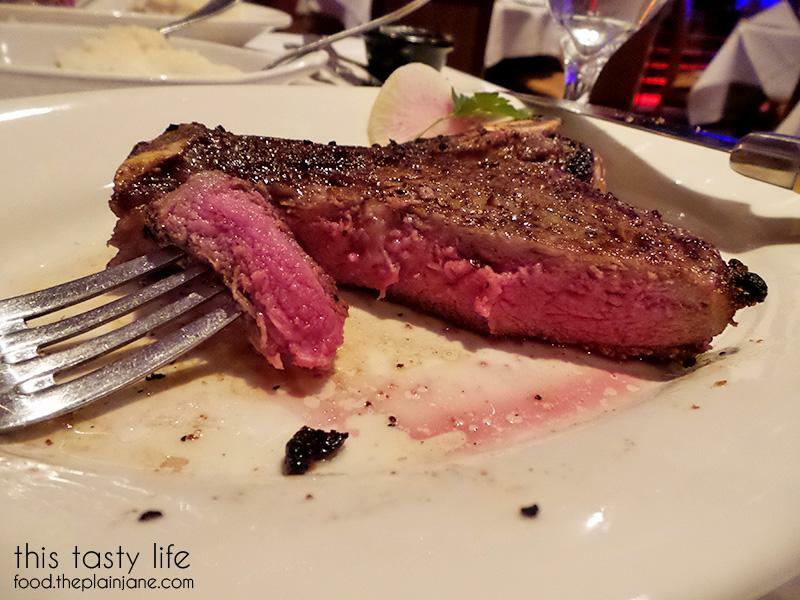 I was NOT invited to Greystone Steakhouse – we just really enjoyed our food there! All opinions stated here are my own. god that steak looks amazinggggg. OMG I loved that steak so much. 😀 I like our picture together, too! Sorry it was hard for me to talk that evening, my voice was all weird and it was so loud in that alleyway! Glad we got to see you & Dennis for a little bit!